Sometimes it's hard to decide which event in a week to write about. Other times the subject justs jumps out at you and says, "Here I am! Write about me!" This week it's the latter, and it's a double-header. Galerius was born about AD 250 in a little village near Florentiana in Upper Moesia. His father was a simple peasant and his mother came from beyond the Danube. At first it appears he worked as a herdsman, a man of violent character, fond of pleasure and politically insignificant; but then he joined the army and proved to be an efficient soldier, then a loyal officer devoted to Emperor Diocletian. In 293 Diocletian divided the empire into a tetrarchy, that is he created four lesser empires and assigned his best and most trusted confidants to serve a junior Caesars. Galerius, together with Constantius Chlorus, was chosen from the senior military leaders. He took the name Gaius Valerius Maximianus and was entrusted with rule of the powerful Balkan provinces, Pannonia, Moesia and Thraciae and the Diocese of Asiana in Asia Minor (Turkey). Galerius' tenure as junior Caesar had its ups and downs (he suffered an embarrass ing defeat at the hands of the Persians but managed to exact his revenge a few years later) but over all his power and influence grew. So much in fact, that most historians ascribe the four edicts against the Christians published after 303 by Diocletian, who was himself a strong believer in the heathen superstitions. Much points toward Galerius in this respect. His mother Romula was said to have been a fanatical paganist. Having grown up under the influence of such religious zealotry, it is well possible that Galerius's feelings should have been very hostile toward other religions. The Christians had been gaining converts at ever increasing rates, both among the soldiers and the civil officials. Magnificent churches were being erected in the large cities, and the time seemed not far distant when the new religion would become more popular than the old. Christianity therefore, had to go; believers needed to be rooted out, the Holy Scriptures must be abolished, the churches destroyed, and the cemeteries confiscated. 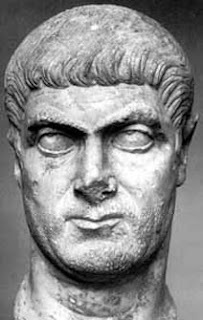 The edicts, ever increasing in severity, were enforced much more strictly in the East where Galerius was in command than in the West. It was in the East that the decisive struggle between paganism and Christianity was fought out. When Diocletian voluntarily abandoned the imperial throne at Nicomedia in May, 305, he named Galerius his successor. The latter thenceforth passed most of his time in Illyricum. Galerius himself is believed to have issued an edict in 304 requiring everyone in the empire to sacrifice to the gods of the empire on pain of death or forced labor; hundreds of Christians executed. When Diocletian abdicated, Galerius became senior emperor in 305. He didn't let up, in fact his persecution became even more widespread. However, Christianity simply would not go away. Eventually even Galerius began to suspect it would be impossible to snuff out the illegal religion. Then in the year 311 he became ill. A Christian writer named Lactantius said that Galerius' flesh began to rot away and was eaten by maggots while he writhed in agony. Some members of Galerius' household claimed the emperor connected his illness with the persecution of the Christians. He seems to have seen his illness as a judgment from the Christian God. Whether or not this is true we will likely never know for sure. At any rate, he issued an edict which mentioned only Christians. The edict began by justifying his previous edits. "Amongst our other measures for the advantage of the Empire, we have hitherto endeavored to bring all things into conformity with the ancient laws and public order of the Romans. We have been especially anxious that even the Christians, who have abandoned the religion of their ancestors, should return to reason." Noting that some of the Christians had betrayed their faith out of fear while others endured torture, Galerius for some inexplicable reason also declared, "we, with our wonted clemency, have judged it wise to extend a pardon even to these men and permit them once more to become Christians and reestablish their places of meeting..."
In a final attempt to hedge his chances Galerius added, "...it should be the duty of the Christians, in view of our clemency [mercy], to pray to their god for our welfare, for that of the Empire, and for their own, so that the Empire may remain intact in all its parts, and that they themselves may live safely in their habitations." Galerius wanted the Christian's to intercede on his behalf. Reminds me of Pharoah aand Moses (Exodus 8:28) Did he hope for a miracle? If so, he was disappointed. He died a week after issuing the edict. His successor, Emperor Maximinus, tried to counteract the edict but did not succeed to any great extent in his short rule. The Great Persecution of Christians had ended. Now... why do I call this a double-header? Because both the fourth and final edit ordering the persecution of the Christians in 304, and the issuing of the edit that ended the persecution in 311 went out from Galerius on April 30 exactly seven years apart; 1,703 and 1696 years ago this week. April 29, 1429 - Joan of Arc, who had experienced mystical visions and voices since childhood, enters the besieged French city of Orleans to lead a victory over the English. The next day, the English retreated, but, because it was a Sunday, Joan refused to allow any pursuit. On a sortie the next year, The English captured Joan and put her on trial for heresy. May 1, 1873 - Missionary-explorer David Livingstone dies. Responsible for "opening up" central Africa and for popularizing missions to that continent, Livingstone himself only made one convert—who later backslid. Still, he is widely considered one of Christianity's missionary heroes. May 2, 373 - Church father Athanasius, "the father of Orthodoxy," dies. He attended the Council of Nicea, and after becoming bishop of Alexandria, he fought Arianism and won. He was also the first to list the New Testament canonical books as we know them today. May 3, 1675 - A Massachusetts law goes into effect requiring church doors to be locked during services. Officials enacted the law because too many people were leaving before sermons were over. May 4, 1873 - Father Damien enters the Leper Colony on Molokai Island, Hawaii to minister to the population there. Ignored by everyone, the residents of the colony lived what Damien described as "the most retched existence imaginable." For the next twelve years he devoted himself to reforming conditions on the island and bringing the souls of the residents to salvation. His mission ended when he contracted the disease himself. He died four years later. His unselfish devotion inspired many others around the world who continue his work to this day.